Books and Sensibility: Kat's Bloggiesta To Do List ! Ole ! Kat's Bloggiesta To Do List ! Ole ! So, this weekend is a bit busy for me with Easter dress shopping, job hunting and other things, but I still plan to do some Bloggiesta stuff ! - Update and organize Books and Sensibility's Goodreads. Good luck on your list! It's hard to make time but I hope you get some things done! Here is my Bloggiesta List. Good luck with your list...I always make a long list, but even if I only get a few things done, I feel it's a productive weekend! Some excellent goals! I need to update Goodreads, too. 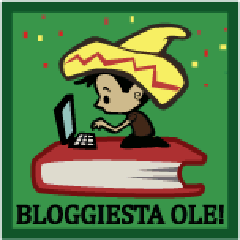 Sounds like you've got some great things lined up for Bloggiesta! I always find myself deviating from my list and tweaking other things, haha! We'll see what I manage to accomplish this weekend. Glad to have stumbled across your blog this weekend! Grabbed your button and hope you might do the same! I'm also a new Twitter follower. Good luck to you! I think the edit everything in the draft folder is a great one. Sometimes, I forget that I have things in there :) Good luck! I hope you check out my Bloggiesta To Do List or join my mini-challenge about getting involved! One of my Bloggiesta goals was to update Goodreads as well. Done! ;) I hope you're having a great weekend! Good luck on your goals! It's always nice to catch up, isn't it?